Definition at line 21 of file CQTimeSeriesDM.h. Definition at line 19 of file CQTimeSeriesDM.cpp. Definition at line 25 of file CQTimeSeriesDM.cpp. Definition at line 37 of file CQTimeSeriesDM.cpp. Referenced by data(), headerData(), and setFramework(). Definition at line 51 of file CQTimeSeriesDM.cpp. References columnCount(), CTimeSeries::getConcentrationData(), CTimeSeries::getData(), mFramework, mpTimeSeries, and rowCount(). Definition at line 45 of file CQTimeSeriesDM.cpp. Definition at line 72 of file CQTimeSeriesDM.cpp. References columnCount(), FROM_UTF8, CTimeSeries::getTitle(), mpTimeSeries, and rowCount(). Definition at line 115 of file CQTimeSeriesDM.cpp. Definition at line 127 of file CQTimeSeriesDM.cpp. Definition at line 121 of file CQTimeSeriesDM.cpp. Definition at line 29 of file CQTimeSeriesDM.cpp. Referenced by data(), headerData(), CQTimeSeriesWidget::loadResult(), and setFramework(). Definition at line 109 of file CQTimeSeriesDM.cpp. 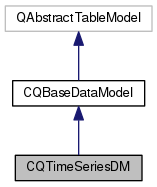 Definition at line 101 of file CQTimeSeriesDM.cpp. References columnCount(), mFramework, and rowCount(). Definition at line 95 of file CQTimeSeriesDM.cpp. Definition at line 53 of file CQTimeSeriesDM.h. Referenced by data(), and setFramework(). Definition at line 52 of file CQTimeSeriesDM.h. Referenced by columnCount(), data(), headerData(), rowCount(), and setTimeSeries().